I struggled for a long time trying to name this article. John Rutledge played such a gigantic role in the Founding of the United States that I could not decide how to present it. So, I went with the shocking title. John Rutledge was a signatory of the Stamp Act petitions, attendee at the First Continental Congress, Governor of South Carolina, signer of the Constitution and Chief Justice of the Supreme Court. Then he attempted suicide. It is unbelievable he is not more well known in the United States today. John Rutledge was a feisty young lawyer from South Carolina who, at just 26 years of age, represented his colony in the Stamp Act Congress. At this meeting, Rutledge oversaw the committee which drafted the petition to the House of Lords. Almost a decade later, Rutledge was again sent as a delegate to meet with the other colonies, this time to the First Continental Congress. Now in his mid 30’s, John signed the Continental Association, which was the first major American Founding Document. Just before independence was declared, Rutledge left the Continental Congress and returned to South Carolina, where he had just been elected President under the colony’s new constitution. His brother, Edward Rutledge, replaced him in Congress (and would himself sign the Declaration of Independence). As President, Rutledge was focused on overseeing the militia. When the British first came to attack Charleston, John disagreed with Major General Charles Lee about evacuating the city. Instead, Rutledge instructed William Moultrie to defend the city. In the ensuing Battle of Fort Sullivan, Moultrie turned the British away and ended up giving South Carolina both its State Motto and State Flag in the process. The following year, South Carolina again changed governments and Rutledge was elected as the State’s first post-independence Governor. As Governor, John was able to stave off a second attempt to invade Charleston, but was thwarted on the third try by overwhelming British numbers and a smallpox epidemic. After his term limit expired, Rutledge spent two more years in the Continental Congress. This was followed with him being named to the State’s Court of Chancery (similar to the Supreme Court). 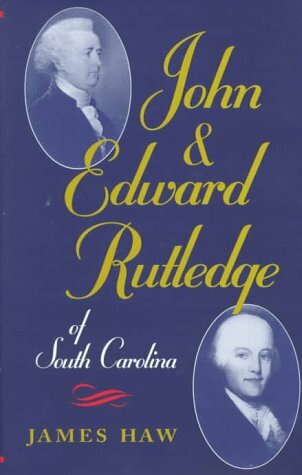 By 1787 John Rutledge was one of the most respected leaders in South Carolina. As such, he was sent to Philadelphia to participate in the Constitutional Convention. As one of the more moderate members of this meeting (and one who attended every session), Rutledge was asked to be Chairman of the Committee of Detail. This committee produced updated drafts of the Constitution as it was being worked on. Notably, John's first draft included many procedural points for the inner workings of Congress. As these points were standard at the time, they were never debated on the floor and therefore easily made their way into the final document. Rutledge also played a substantial role during debates on the executive, appropriation bills, and property ownership requirements. At the end of the session, Rutledge signed the Constitution. After the Constitution was ratified and the new government took it’s seat, George Washington appointed Rutledge to the Supreme Court. Taking office the same day as John Jay, he was one of the original members of this prestigious body. When Jay resigned to become Governor of New York, Washington chose Rutledge as a recess appointment to be the Second Chief Justice of the Supreme Court. Unfortunately, John seems to have been losing his mind a bit (though contemporary accounts in the newspapers were most likely exaggerated). Rutledge gave a speech against the Jay Treaty which contained hostile words for President Washington. This was a bad idea, as he had still not been confirmed by Congress to be the permanent Chief Justice. Rutledge was not approved and was replaced by Oliver Ellsworth. Days later, desperate and embarrassed, this lifelong Patriot attempted suicide by throwing himself off a dock into Charleston Harbor. Fortunately he was saved by two passing slaves who brought him ashore. His mind now clearly having begun to slip away, and his once spotless reputation tarnished, John Rutledge quietly retired and spent his remaining years out of the public eye. To learn more about the star of this story, try reading 'John and Edward Rutledge' which discusses both John and his brother Edward and their participation in the Founding Period. It is, surprisingly, the only decent biography of this extremely important Founding Father. If you can't find it at your library, pick it up from the link below through our affiliate Amazon...you will be supporting this site at no additional cost to you! And if you'd like a new Founder every day, consider subscribing to our email list here.